The latest hop research has revealed that you can, in fact, bitter your beer through dry hopping via humulinones and alpha-acids1. You can read more about humulinones from this previous post, which summarizes the latest research. This revelation made me curious what a beer would taste like, specifically the bitterness characteristics of a beer, brewed completely with heavy dry hopping (no hot-side hops at all). I gave it a shot in a Citra/Amarillo NEIPA and along with forcing people to taste it, I also sent the beer off to get tested for bitterness via HPLC testing, which can differentiate between the different hop acids unlike the international bitterness test (IBU test). In addition, I sent a small sample of the hops used, which were tested for their humulinone, alpha acid, and beta acid content. I took this beer to a friend’s house who was having an annual HopFest, a fun night of blind tasting 20 commercial IPAs and ranking each one on a scale of 1-10 (Toppling Goliath pseduoSue Double Dry Hoppped won). Prior to slapping our pallets with hops, I had everyone first give this beer a try. Ironically, the very first words spoken about it, was “it’s really bitter,” although this wasn’t a consensus opinion. I think most agreed that something was a little off with it and that it lacked that NEIPA punch of flavor and aroma. There were a couple of things that stood out to me in this beer, the first was the lack of expected Citra and Amarillo aroma. Despite being dry hopped with 10 total ounces of hops, the overall aroma was fairly subdued. I wonder if capping the fermenter so early (on day 4) might be part to blame for this. Although mostly fermented out, I wonder if this doesn’t restrict the esters a little and trap in some of the unwanted flavors of fermentation-fermentation farts if you will-that may compete with hop aroma/flavors? The other thing that stood out to me was how quickly the beer seemed to visually oxidize. Despite being carbonated under pressure naturally, transferred to a purged keg via C02, the beer seemed to progress from a light straw color to a light brown color over the course of a month (picture above is after sitting a month). The aroma out of the glass was reminiscent of a slightly aged bottled IPA, which surprised me. I thought if anything, this beer would have a huge hop nose, but that just wasn’t the case. It was noticeably bitter, but also noticeably a different bitter characteristic than I’m used to. I think it’s best described as a harsh initial vegetal bitterness, that quickly fades. There was little to no clinging or cloying bitterness (the kind of bitterness that makes you smack your lips). If you dry hop in the keg sometimes you’ll notice the first couple pours are little harsh as some of the hops settle and small hop particles land in your glass, to a much lesser degree, this is how the bitterness character came across the entire duration of the keg. There was very little hop flavor, so little in fact that I’m becoming more convinced of the whirlpool/steep step (or maybe just late addition hops) contributing to the hop flavor aspect of NEIPAs. I’ve been a little skeptical that such a step is necessary when so many of the oils are evaporated during the boil and purged or changed during fermentation, but it was extremely clear to me that this beer had very little of that hop saturated flavor that makes NEIPAs so tasty! As a reminder from the literature, high-performance liquid chromatography (HPLC) testing allows for the separation and accurate measuring of the various hop acids in dry hopped beers. In other words, HPLC testing allows for measuring the individual hop acids: iso-alpha-acids, alpha-acids, humulinones, and beta-acids accurately. In contrast, typical IBU testing cannot differentiate between these acids, which is important because we now understand better the different levels of bitterness each imparts. Calculated Sensory Bitterness = ppm iso-alpha-acids + (0.66 × ppm humulinone) + (0.10 x ppm alpha-acids). The traditional IBU test came back with a bitterness level of 76.9! This is incredibly interesting to me for two reasons. The first being that a beer brewed without using any hops on the hot side, where traditional brewing knowledge says is the only way to get bitterness, resulted in a beer with an incredibly high IBU figure. Second, this traditional IBU figure is entirely misleading once you take into account sensory bitterness figures, taking a beer from double IPA bitterness levels down to a Sam Adam’s Lager territory. The makeup of the IBU figure is 57 out of the 76 IBUs is coming from the alpha acids and humulinones and only 2 IBUs is coming from iso-alpha-acids, the rest most likely from polyphenols. You might be thinking, wait a minute, how can you possibly get 2.7 ppm of iso-alpha-acids in beer without ever adding hops to the boil or whirlpool to isomerize? I had the same question and asked John Maye (author of the latest bitterness studies on humulinones) and was informed that the amount of iso-acids in this beer was incredibly low for the amount of hops used, meaning the isomerization efficiency was tiny. As far as how the isomerisation took place in the first place, Maye suggested two possible avenues. First, is that they have seen in their lab minerals like magnesium (which you can get from malts, even if you don’t add it to your brewing water) can cause alpha acids to isomerize. The second possibility is that Maye though it was possible that a very small amount might isomerize slowly over time while the beer was at room temperature and during fermentation. In this case, I added 56 grams of dry hops even prior to fermentation starting and another 112 grams mid-fermentation. As far as hops in the keg and in the fridge, Maye said this long-term storage won’t result in alpha-acids isomerizing because of the cold temperatures. Another interesting aspect of these results was the incredibly high alpha-acid content in the finished beer, which was higher than the lab had ever essayed before. The reason the alpha-acid content tested so much higher than humulinones is because despite humulinones being more soluble at dry hopping temperatures, there are more alpha-acids than humulinones in the hops. Again, alpha-acids aren’t contributing much to bitterness being only 10% as bitter as iso-alpha-acids, but the powerful antibacterial nature of hop acids means it’s fairly unlikely to get a bacterial infection during fermentation with intense and especially early dry hopping. Even more so if you are adding hops to the boil considering that Maye suggested to me that only 8 ppm of iso-alpha-acids are needed to inhibit bacteria.2 Utilizing this information to sour beer brewing, it’s interesting to think you could potentially use dry hopping as a way of controlling your acidity level. One ounce of dry hops may be enough (from alpha-acids alone) to significantly halt the bacteria. Although I haven’t seen any data on this and am just speculating based on this current research, but it does seem worth experimenting with. In addition, dry hopping at a dose rate of 1 lb/bbl increases the pH of beer by about 0.14 pH units and this pH increase is nearly linear, so 3 lb/bbl will increase the pH by 0.42. The great thing about continuing to research hops is I’m constantly reminding myself how little I know and thus, keep changing my opinions on certain brewing processes. I was very skeptical of whirlpool hops lending characters to beer because of the high amount of reported losses to do evaporation and again during fermentation. However, after this beer, it does seem that hot-side hops are contributing to this flavor aspect. Perhaps through oxidation of certain compounds during the boil or the bioconversion of compounds surviving the boil. This is an area I look forward to exploring some more. Although humulinones are said to have a smoother bitterness and are calculated around 66% as bitter as iso-alpha-acids, I had mixed reactions to the overall bitterness quality of this beer. It’s smoother in the sense that it doesn’t linger in your mouth like a highly bittered double IPA would. On the other hand, the initial blast of bitterness came across harsher and more vegetal than I’m used to in an NEIPA type of beer like this. I wonder if the mass amount of hops used, thus higher than usual green matter used on the cold side, had more to do with this harshness than the measured humulinone content. The high final tested pH of this beer of 4.64 is not surprising considering the intense dry hopping, which raises pH, but has also been reported to increase bitterness intensity, which can also be at play here. The issue of why the aroma was so much less than I anticipated is a little confusing still, but one factor could be the yeast strain. RVA Manchester ale is a great rich leaning ester strain, however, I have noticed this can come at the expense of some hop punch (although they can pair extremely well together). I asked Maye too if he had any initial thoughts as to why the overall hop character was so low despite the large dry hop additions, essentially being triple dry hopped. Maye’s thought (again, just a thought here) is it could be possible that the leaf material introduced to the beer was so great that it removed/absorbed much of the hop oil, which could effectively reduce the aroma. This brings up another area of research I’d like to explore, hop saturation points! I made a similar beer awhile back (same yeast strain), which had only a small amount of hops added to the hot-side (16 grams in a 5.5 gallon batch) and was then followed up with 168 grams of dry hops (6 ounces) and the results were much better than this one! Comparing the two beer notes now, it seems possible the 10 total ounces of dry hopping is in fact too much and as I mentioned, a likely cause of the vegetal bitterness. As far as getting more hop flavor with just 16 grams in the whirlpool, that’s a little surprising. The other differences in process were the previous beer had no hops added at the start of fermentation and the fermenter was never capped, and there was slightly less hops added to the serving keg. Interestingly, this is about the fifth hoppy beer I’ve capped fermentation on during the later stages of fermentation and I haven’t been happy with the aromatic qualities of any of them. Big thanks to Hopsteiner for testing my results and to John Maye for helping me break down the results! 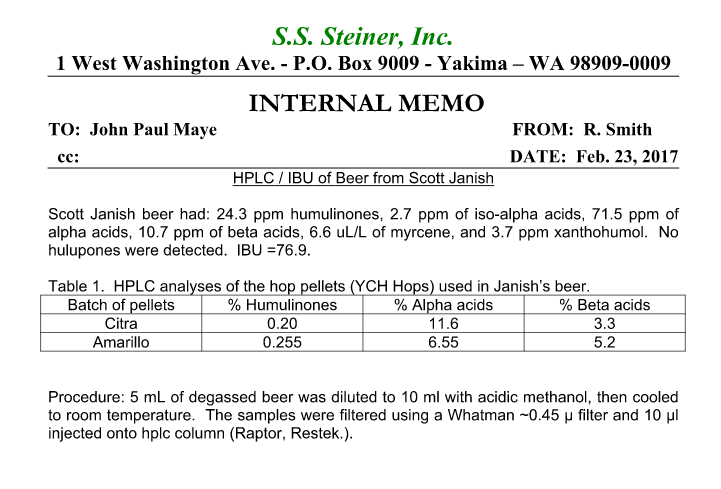 One thing that stood out to me with the HPLC analysis was the difference in the humulinone-to-alpha acid ratio in the hops versus the ppm found in the beer. This must be explained by the limited solubility of alpha acids versus humulinones! Thanks, I’ll check it out (hope others will too)! I agree, that is interesting, humulinones are more soluble, but because the hops have such a higher percentage of alpha acids, the alpha acids still get into the beer at higher concentrations via dry hopping. Do you have any further speculation as to the cause of the apparent accelerated oxidation? This problem sounds very similar to an issue I had with a heavily dry hopped NE style IPA. Mine was bottle conditioned and I just chalked it up to aeration during bottling, but sounds like there could be some tie to the amount of dry hops? Potentially the higher levels of proteins making their way into the final keg. Cold crashing for example might help. I’m not completely sure however, it something I need to look into further. I would def dig into oxidation / oxygen pickup. This is clearly an issue here and limiting your sensory feedback . send me a note or tweet @reinkster and i will share a ton more ! I had similar problems with oxidation, in all bottle conditioned attempts. Cold crashing and kegging the recipes helped dramatically. I suspect that the extra weeks in the bottle, conditioning, are not doing NEIPAs any favors, either. The style’s golden zone is fleeting to begin with. I wonder if there is more of a process issue associated with the diagnosed premature aging rather than with the elimination of hot side hops. Adding that many hops to the serving keg must have introduced quite a bit of O2. Perhaps there wasn’t enough extract or yeast activity at this point in order to consume the O2 fast enough? The hops were added to the serving keg and then the keg was purged multiple times with C02 and the beer was transferred in via c02, so I would hope a lot of the oxygen would be removed. Does Hopsteiner regularly test their hops with HPLC, or just IBU? During a hop seminar at CBC I got the impression that they do in fact do a lot of HPLC testing for bitterness for some of their customers. Do you think a shorter dry hop period would help? As in less perceived bitterness would get in the beer? I normally make sessionable NEIPAs and dry hop the crap out of them. Sometimes they come across harsh with bitterness and I didn’t use any hops in the boil, just whirlpool. I’m curious what would happen if you dry hopped with a large amount of hops for 24 hours if that would help. Thoughts? Without finding the exact reference, I do believe I have read that polyphenols, for example, do increase with dry hop duration. I think this study was something like 6-hours to 12 days. So if it’s polyphenols causing at least some of the harshness, dry hop duration could be a factor. I wonder if it’s more about massive dry hop additions introducing so much vegetal matter to the beer. Maybe it’s worth playing with smaller dry hop additions, but avoiding T-90 pellets (more vegetive matter). So maybe try multiple staged dry hopping and pull the dry hops that are in the beer before adding more? I’d worry a little about oxygen getting in during the process of pulling hops in and out (however if fermentation is active, this would likely be reduced), plus you’ll have them in a mesh bag of some sort I would assume, which has also been shown to reduce extraction. By any chance have you heard of or tried Wild Mind’s Zed (https://www.wildmindales.com/blog/2017/5/25/defying-the-numbers-our-zero-ibu-hopbomb). It sounds like it might be more similar to the “similar beer” you mentioned making (they use 175° whirlpool), and the IBU appears to be untested, but the general idea seems relevant. They’re in Minneapolis, so if you’re at homebrewcon, it might be worth looking them up. I had a similar experience with a recent brew. Also a NEIPA. We did multiple whirlpool additions (flame-out, 170°F, 150°F), shooting for ~ 70 IBU’s total (OG ~ 70). There was a ~ 20 IBU FWH addition to give it some backbone. Added the first dry hops directly to the fermenter (8 oz / 10 gal) at day 3 (fermentation slowing), and the second 8 oz (also pellets directly to fermenter) at day 6. This beer is wicked bitter, even after more than one month in the keg, and after filtering with 5 and 1 µm filters. It’s drinkable, but nothing like the previous batch. By contrast, the previous batch, in which the only difference was the second dry hop addition (hop variety (galaxy vs. columbus/mosaic/chinook), in bags vs. loose pellets, and in the kegs vs. fermenter), was awesome. The most recent batch did not have nearly as much of the juicy aroma or flavor as the previous, where we were expecting much more of that characteristic NEIPA attribute due to the fact that the hops were added directly to the fermenter during secondary fermentation. I have been looking for an answer so that I don’t repeat this mistake. But, there’s not much out there… My gut feeling is that if I simply added the second dry hops in bags (which is how I have always done it) instead of direct, the bitterness would be the same as in my previous batches. This is not the “smooth” bitterness I see sometimes attributed to late kettle additions, etc. This is a cloying bitterness that sticks to the sides of my tongue. It is definitely not due to hop articles, as the beer has been filtered twice. The beer has not obviously oxidized, as the color is still light golden. Any ideas??? Also, I am thinking about sending a sample to a lab, such as Steiner, for analysis. What is the approx cost of an analysis such as shown above (HPLC)? In my experience, when I over dry hop a beer, I also get a very vegetable bitterness bite that lingers. In addition, it’s possible that over dry hopping in one tank like that all that vegetal matter might be pulling out some of the wanted compounds reducing the overall aroma. I’m curious if you tossed in the hops loose, but less of them as well as split the addition between the two vessels (half in primary and the other half in the keg) if that would help with both increasing the aroma and cutting down on the vegetal bitterness. When capped with limited headspace, most CO2 probably dissolves in the beer without forming bubbles. When uncapped, the CO2 probably forms bubbles on hop particles and causes them to rise and dance around in the beer before the bubbles come free (cellulose = great nucleation). This has the potential effect of agitating hop particles and increasing contact/transfer to the beer. What if you had it capped from the start with a relieving regulator (I used $5 Harbor Freight #68223 with keg connected to output port on regulator)? It wouldn’t vent for a period of time, but upon saturating with CO2, it would start venting and causing a hop dance party. One step further- what if you sent the keg exhaust line thru a cold-trap before venting? Would delicious hop aroma be captured in concentrated form? Perhaps bubble thru everclear in the cold-trap. Consider this a dare. Also, are you a fellow Austinite? That’s an interesting theory for sure. The Mad Fermentationist brewed a beer that was transferred to a serving keg at 65% attenuation and then capped with dry hops in the keg with a spunding valve set to 13 PSI. In Mike’s beer, there was dry hopping and fermentation under pressure, however, there was still a release of C02. I tasted this particular beer and the it was great, so potentially there may be something to what you are saying, but the aroma wasn’t as big as he thought when using 8 ounces of dry hops for 5-gallons. Oh, and I’m in the DC area. I would have no clue about how 8 oz dry hop should smell/taste. Uncharted territory for me. Ok, I guess it should taste delicious, I just don’t know the difference between 11 and 12 when my scale only goes to 10. I’ll continue reading your good work. I hope you figure it out. I really want capped fermentation to work. It seems like a great way to prevent hop aroma from escaping to the environment and a way to avoid having to fill CO2 tanks. But perhaps it’s not meant to be. I wondered if you were in Austin because you mention a couple of local Austin breweries in the Lupulin powder post.